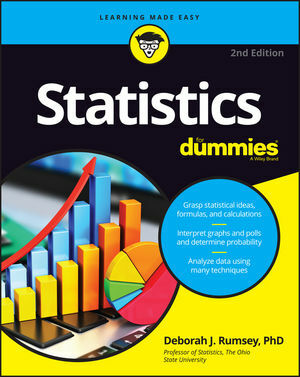 Statistics For Dummies, 2nd Edition (9781119293521) was previously published as Statistics For Dummies, 2nd Edition (9780470911082). While this version features a new Dummies cover and design, the content is the same as the prior release and should not be considered a new or updated product. Stymied by statistics? No fear? this friendly guide offers clear, practical explanations of statistical ideas, techniques, formulas, and calculations, with lots of examples that show you how these concepts apply to your everyday life. Deborah J. Rumsey, PhD, is Professor of Statistics and Statistics Education Specialist at The Ohio State University. She is the author of Statistics Workbook For Dummies, Statistics II For Dummies, and Probability For Dummies.